An Essay written by the late REV. NORMAN MACLEOD, D. D., for "Mountain Loch and Glen," the Illustrations of the Scottish Locus being by JOSEPH ADAM. THERE are no places in the world better known to the traveller or more admired than the Highlands and Islands of Scotland. They form a portion of the "grand tour" of those in search of the sublime or the beautiful in nature. It is almost unnecessary to define, geographically, the "Highlands." When the traveller, on a clear day, gazes northward and westward from the battlements of Edinburgh Castle, he sees the advanced sentinels of the giant army of Highland mountains that lie beyond. 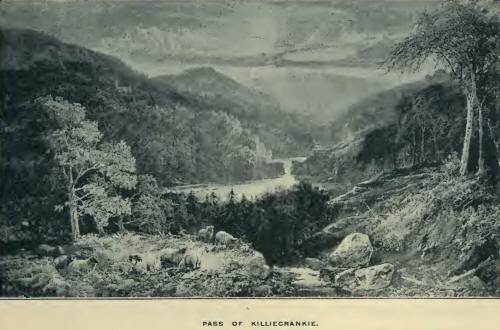 When he journeys to Glasgow there suddenly bursts upon his view, immediately after passing Falkirk, a wonderfully beautiful alluvial plain, rich in woods and signs of busy industry, ramparted along the north by the Ochils and the Trossachs Hills, as it were an advanced line of the Grampian range. This is the very junction of the Lowlands and Highlands. When he sails down the Firth of Clyde, he has to the north, opposite Greenock and onwards, the hills of the true Highlands rolling in beautiful outlines across the sky, and at the Kyles of Bute rising abruptly from the shore, penetrated by the oft-repeated Highland Loch in all its glory, he enters at once, through the dorus mohr, or great door, the Western Highlands proper, with scattered islands, racing tideways, and distant horizon where ocean and sky meet. 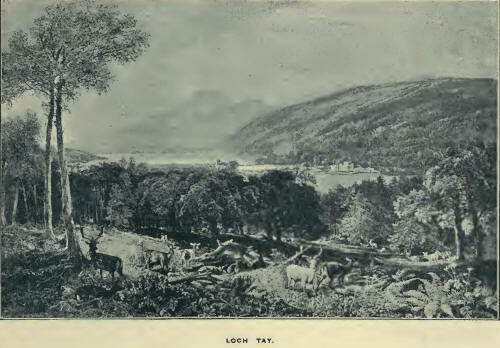 The Southern Highlands lie chiefly to the south of the route from Dunkeld to Oban, by Loch Tay. This district embraces Stirling, Perth, and Dunkeld, with their immediate surroundings, including the Pass of Killiecrankie, with the famous lake scenery of Loch Tay, the Trossachs, Loch Katrine, Loch Lomond and Loch Awe, and the river scenery of the Tay and Forth, all making up the richest and most beautiful of northern landscapes. Scottish scenery, taken as a whole, is equal to any lake scenery in the world. 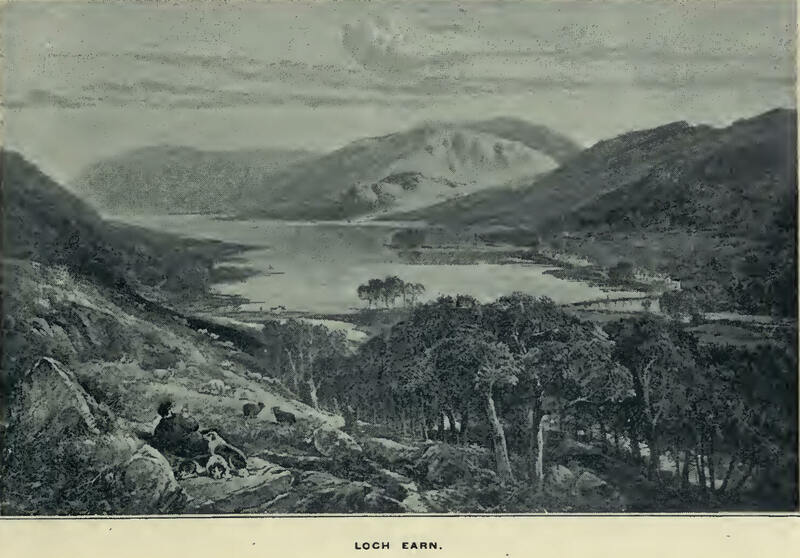 In none have we witnessed greater beauty than in our Highland "Lochs." 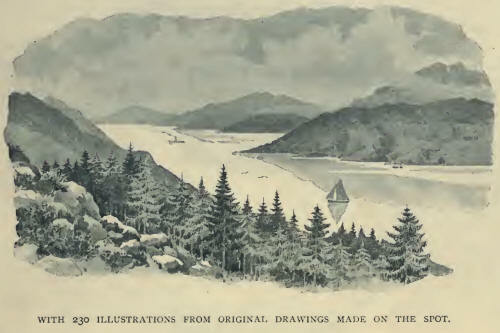 When seen in their best lights, with their wooded islands, the infinitely varied curves of their shore line, the precipices streaked with white waterfalls, the wild copse-wood, and the mountains piled over all, they are unsurpassed, presenting as they do a constant variety of outline and colour—some clothed with grass to their summits, others bare from the debris at their base up to their tortuous scams and jagged peaks. Here are broad glens and winding green straths, with moorlands rolling away; and there are streams innumerable, in little glens full of crystal pools and shadowed by ferns and primroses and drooping moss—streams too, strong and full-flooded like the Tay, the Dee, the Don, the Spey, the Findhorn, and the Lochy, with their banks clothed with surpassing beauty. 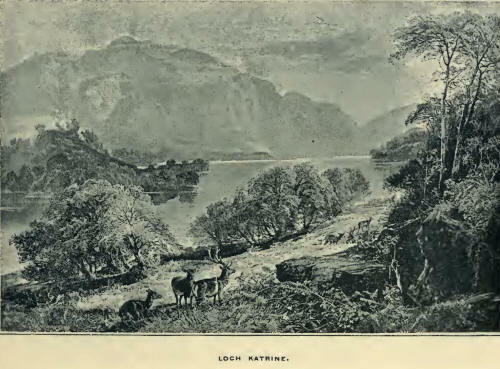 And then the sea lochs, worming their way into the heart of the hills, with endless bights and bays, pretty headlands, and winding nooks of loveliness; every loch made alive by the ebbing and flowing of the' tide, and by the curling seas. There are again, the great glens pouring down their storm blasts from silent peaks and corries of nameless hills, which hold converse with the clouds and changeful mists. And what of the mountain tarns? None but those who have explored some portion of the Highlands can realise the number of those bright eyes, shining in beauty, too minute and numerous to be indicated on any map or in any guide book. 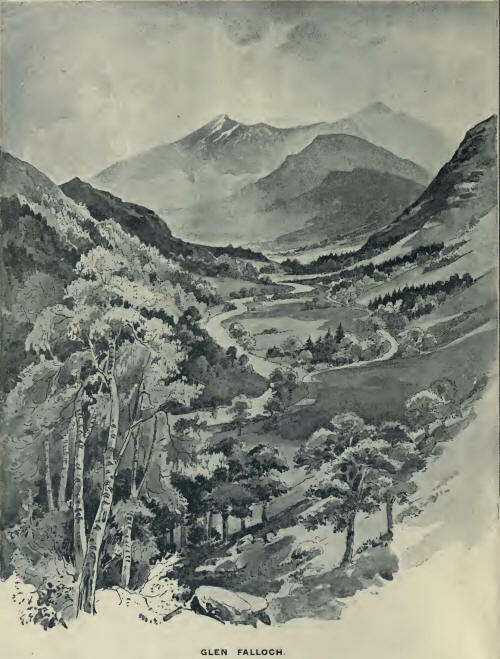 What spots there are, too, of unknown beauty, with their framework of lichen-coloured peaks, and their great boulders, gnarled trees, masses of blooming heather, and lakelets, visited only by the wild deer. Then the sea, which contributes so largely to the scenery of the West Highlands, revealing itself in every possible form—sometimes in salt-water rivers, sometimes in calm winding highways between the islands, but most grandly when it spreads its vastness to the horizon, everywhere modifying and connecting the landscape of the earth with the scenery of cloudland and sky above. To fully realise this vast variety of scenery, we have only to climb some central mountain in the West Highlands. We must ascend the green slopes, pass along the sides of the burns, thread the pine wood, and front the precipices and "sevidans," till from the windy summit we scan the inland lakes and tarns, and gaze on the vast extent of hills and the ocean far away, in order to see how great is the variety of our Scottish Highland scenery. In no other country, for example, do mountains rise from an expanse so vast. Where, save in the north, is there any scene like the Moor of Rannoch, with its bleakness) with its bleached boulders and deep cuts in its surface, as if through its flesh into its bone, all filling up a space of twenty miles, bounded by shadowy hills? We do not attempt here to describe our Lake Scenery. This has already been done with a spirit and power which belong to "Christopher North" alone. But beautiful as it is, it wants the bare, dark, savage grandeur of the Western peaks and passes; it gives no hint of the loneliness of the great Western glens, or of the solemn power of the great seas that roar against the grim headlands, or pour their cataracts on the reefs and islands of the outer Hebrides. Compared with this stern and sombre outer world, the lakes are as calm lagoons reflecting the form of quiet beauty sleeping in the arms of strength. There are periods when there is no scenery visible in the Highlands save that of cloud and mist. Were it not for these mists the scenery would be wanting in much that contributes to its beauty. We should miss the waterfalls and cascades, and that world of beauty which is visible along the course of every tiny mountain rivulet, and in every crevice of the huge boulders scattered at the base of the mountains. The beginning and the ending of days of rain and cloud and grey mist, so memorable in what they conceal from the traveller, are the precise times in which marvellous effects of light may be witnessed. How transparent is the atmosphere charged with moisture, before that moisture is condensed so as to produce the "rainy day." How distances diminish—the opposite shores of the loch and the distant mountain being brought nigh, and every cleft and rocky precipice and bare scaur revealed with vivid clearness. The sun strikes through wild glens, and lights up the bare wet rocky sides with a silver sheen; and distant promontories come into view, and the line where sky and ocean meet is so clearly seen surrounding both, yet so far away. And then, what a sight it is! when the rain has spent itself, and the clouds, which have emptied themselves, are rolling up like a scroll, and every hillside is streaked with foaming streams, while the green pastures revive, and the trees, gleaming with diamond crops, "clap their hands with joy." What can surpass the effects of the thin mist which veils the precipices, or wreathes itself around them, then vanishes in light eddying vapour from their summits, until lost in the intense and infinite depths of azure. Can anything surpass the exquisite blues and purples of the hills at such times, their indescribable softness of outline, and impalpable film of misty light which is cast over sea and land? And who can forget the effect produced on the northern landscape when the clouds group themselves in towering masses, while far above light fleecy streaks break the expanse of the summer sky with the glorious vista along the mountains, as range after range discloses itself, until lost in distant peaks "that mingle with the sky?" Where can there be seen more glorious effects from colour than on a clear day at morning or evening, when the rising or the setting sun lights up the woods, with the arn and birch and wild cherry, robed in orange and gold or bright crimson, mingled with the dark pines and firs; and when it fires the gorgeous purple heather of the mountains, and brightens the masses of yellow fern? And to the charms which these scenes possess in themselves must be added the fascination with which in most minds they have been invested by the pen of the "Northern Magician." We were forcibly impressed with this when visiting the Trosachs for the first time. One old Highlander spoke to us frankly of the changes which had taken place in his day. "I and my father," he said, "used to guide the few travellers who came here up Ben Lomond. But no one will take my road now. And that is very curious, because it is the best! But the fact is," he added, with a peculiar smile; "more men are fools than I once believed. And what have you of it now but this—that a Lowlander--one of the name of Scott, or Sir Walter Scott, who knew nothing about the country—wrote a heap of lies on the Trossachs. I do assure you he told stories that neither I nor my father ever heard about this person and that who never lived here —about an Eelen and a FitzJames, and trash of that sort: Of course, ignorant Sassenachs take all that for gospel, and make new roads and build new hotels, and get new boats, and even steamboats and new guides, who laugh at the tourists and get their money. And so, you see, no one comes my old way to Ben Lomond now. But och! it's a sad sight, most lamentable, to see decent folk believing lies, lies, nothing but lies." We write these notes among the "Braes of Lochaber." The scenery around exhibits all that is characteristic of the Western Highlands. Let us suppose ourselves seated on a green headland, rising a few hundred feet above the sea level. In itself this elevation is remarkable for nothing more than the greenest grass; consequently, in the estimation of the shepherd, it is one of the "best places for -wintering sheep"; and it is the more fitted for such a purpose owing to its being broken up by innumerable hollows and dykes of trap which afford shelter to the sheep from every wind. Moreover, the snow seldom lies here, as it is speedily thawed by the breath of the temperate sea. It has its own secluded spots of Highland beauty, too, although these are seldom, if ever, visited by any save the solitary herdboy. In these nooks nature, as if rejoicing in the undisturbed contemplation of her own grace and loveliness, lavishly grows her wild flowers and spreads out her drooping ferns. Nay, she seems unconsciously to adorn herself with tufts of primroses, bluebells, and heather, and slily retires into little recesses, to enter which one has to put aside the branches of mountain ash clothed with bunches of coral fruit, as well as the weeping birch and hazel, in order to get a glimpse of the rivulet that whizes between banks glorious with green mosses, lichens, ferns, honeysuckle, and wild roses. In the spring such recesses are a very home of love for piping birds. Lifting our eyes and looking round, how thoroughly Highland the whole scene is, and how distinguished from every other of its characteristic features! Our promontory forms the one side of the entrance to a salt-water beach, Loch Leven, a branch of the great sea-river of Loch Linnhe, which flows northward from Oban to the Caledonian Canal, and the hollow of whose waters is continued in the line of the Great Caledonian Valley, with its fresh-water lakes. Looking eastward, we are struck by the wonderful beauty of Loch Linnhe itself. On the southern shore lies the green Ardshiel—one of the homes of the Episcopalian and Jacobite families of the Stewarts of Appin, who were ever faithful to their Church and Prince "Charlie." Above and beyond Ardshiel is a mountain, green to its rounded summit with fine strips of native wood dotting its surface, forming beautiful curves, and out of which, here and there, flash the cascades of rivulets that sweep downwards to the sea. Higher still, and beyond, is a bare sharp ridge without a blade of grass. On the opposite, or southern, side of Loch Leven, are upraised beeches, with flats of fine alluvial soil, stretching out to the shore, and backed by limestone hills of richest green, at the base of which little scattered white cottages nestle snugly. The winding shores sweep into sandy bays, which reflect white marble rocks, gleaming through trees. But the grand and commanding object at the head of Loch Leven is Glencoe. Its precipices rise like a huge dark wall. Tremendous buttresses from base to summit disengage themselves from their surface, and separated from each other by depths such as might have been cut and cloven by Thor's great hammer, wielded in stormy passion. The mountain is scored across by deep lines as though they marked the successive floods of molten rook poured out by volcanic forces. Nothing can be more utterly sombre, sad, and desolate than this Glencoe. We have watched it in its every mood—sometimes when it seemed to sleep like a wearied giant, wrapped in the sun-mist; sometimes when it began to arrest the western clouds, until, as if overcome by their stifling power, they covered it with impenetrable masses black as night; or, again, when slowly and solemnly it unveiled itself after the storm, and the sun crept up to it, after visiting the green fields and the trees below, until at last it scattered the clouds from the dark precipices and sent the mists flying —not fiercely, but kindly ; not hastily, but slowly—in white smoke up the glens, tinging with auroral light the dark ridge as they streamed over it; while the infinite sky appeared without a cloud over all, and as if supported by the mighty pillars of the glen. 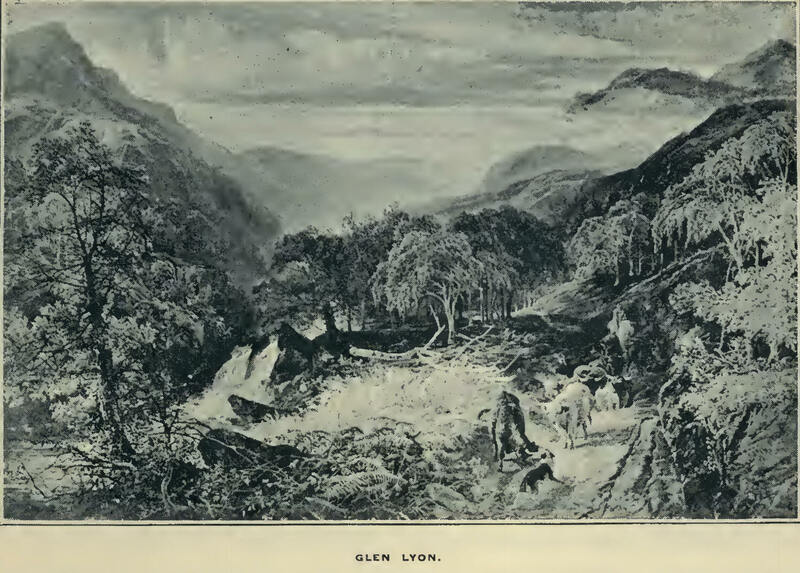 Let us refer to the impressions made by another scene by a writer who is well acquainted with Highland scenery, and who views it not only through feelings "unborrowed from the eye," but with the eye itself, informed and guided by a deep and exact knowledge of the geological structure of the country, which has moulded the outward forms on which fancy and imagination act and are acted upon. 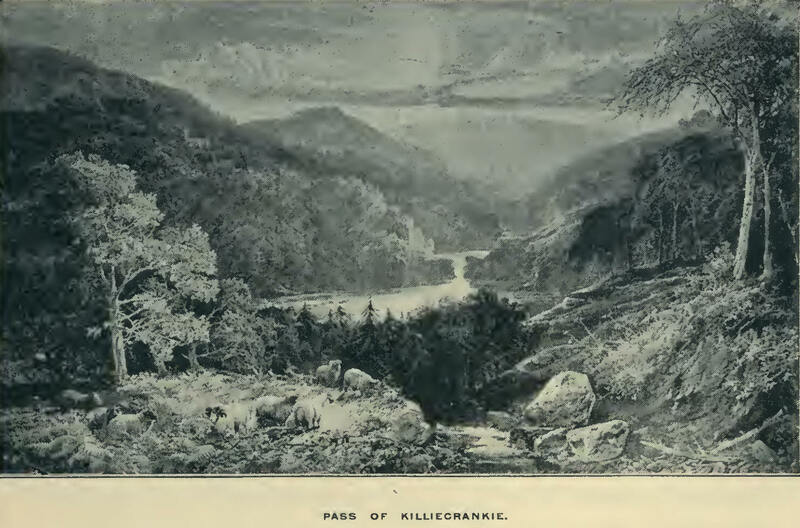 Professor Geikie gives this description of a scene in Sutherlandhire:- "You may stand on one of its higher eminences and look over a dreary expanse of verdureless rock, grey, cold, and bare, protruding from the heather in endless rounded crags and knolls, and dotted over with tarns and lochans, which, by their stillness, heighten the loneliness and solitude of the scene. Acres of sombre peat-moss mark the site of former lakes, and their dinginess and desolation form no inconspicuous feature in the landscape. Few contrasts of scenery in the Highlands, when once beheld, are likely to be better remembered than that between the cold grey hue and monotonous undulations of this ancient gneiss, and the colour and form of the sandstone mountains that rise along its inner margin. These heights are among the noblest in the whole Highlands. They consist of red Cambrian sandstone lying on the upturned edges of the gneiss, and with their strata so little inclined that these can be traced by the eye on long horizontal bars on the sides of the steeper declivities. Viewed from the sea, the gneiss belt runs in a line of bare rough hills and low headlands, among which, save here and there along a larger water-course, or on a straggling patch of gravelly soil, one looks in vain for tree or field or patch of green to relieve the sterility of these lonely shores. Behind rise the sandstone mountains in a line of irregular but stately pyramids, their nearly level strata running along the hillsides like lines of masonry. Here and there the hand of time has rent them into deep rifts, from which long mounds of rubbish are rolled into the plains below, as stones are loosened from the shivered walls of an ancient battlement. Down their sides, which have sometimes well-nigh the steepness of a wall, vegetation finds but scanty room along the projecting ledges of the sandstone beds, where the heath and grass and wild flowers cluster over the rock in straggling lines and tufts of green. And yet, though nearly as bare as the gneiss below them, these lofty mountains are far from presenting the same aspect of barrenness. The prevailing colour of their component strata gives them a warm red hue which, even at noon, contrasts strongly with the grey of the platform of older rock. But it is at the close of day that the contrast is seen at its height. For then, when the sun is dipping beneath the distant Hebrides, and the shadows of night have already crept over the lower grounds, the gneiss, far as we can trace its corrugated outlines, is steeped in a cold blue tint, that passes away in the distance into the grey haze of the evening, while the sandstone mountains, towering proudly out of the gathering twilight, catch on their giant sides the full flush of sunset. Their own warm hue is thus heightened by the mingling crimson and gold of the western sky, and their summits, wreathed perhaps with rosy mist, glow again, as if they were parts, not of the earth, but of the heaven above them. Watching their varying colours and the changes which the shifting light seems to work upon their strange forms, one might almost be tempted to believe that they are not mountains at all, but pyramids and lines of battlement—the work perhaps of some primeval Titan, who once held sway in the north." But there is yet another characteristic of Highland scenery: that which is created by our associations with the people of the land and their past history. There can be no doubt that the feelings with which we view any landscape, and the impressions made upon us by it, are to some extent a reflection of the light in which it has been already invested by the imagination. Ranges of hills can be found without number, whose outlines are finer and whose natural features are far more striking than those or the mountains that encircle Rome, or those that look down on Athens. Nothing can be more bare and desolate than the sober hills of Palestine. Yet how powerful is the mental influence which all these exercise. They lead captive every thought. They are too dear to be coldly criticised. We love, admire and are silent. 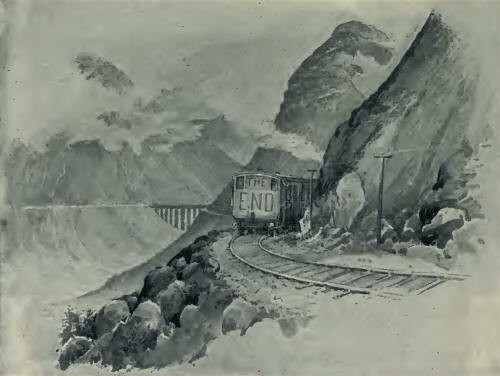 their attachment to their chiefs, the dangers and the hardships and enjoyments of their lonely huntings and fishings, their pastoral shielings on the mountains in summer, and the tales and the sports that amuse the little groups that are frozen into their vast and trackless valleys in the winter. Add to all this, the traces of vast and obscure antiquity that are impressed on the language and the habits of the people, and on the cliffs and caves and gulfy torrents of the land; and the solemn and touching reflection, perpetually recurring, of the weakness and insignificance of perishable man, whose generations thus pass away into oblivion with all their toils and ambition; while nature holds on her unvarying course, and pours out her streams, and renews her forests, with undecaying activity. The East Coast Route—The Midland Route. 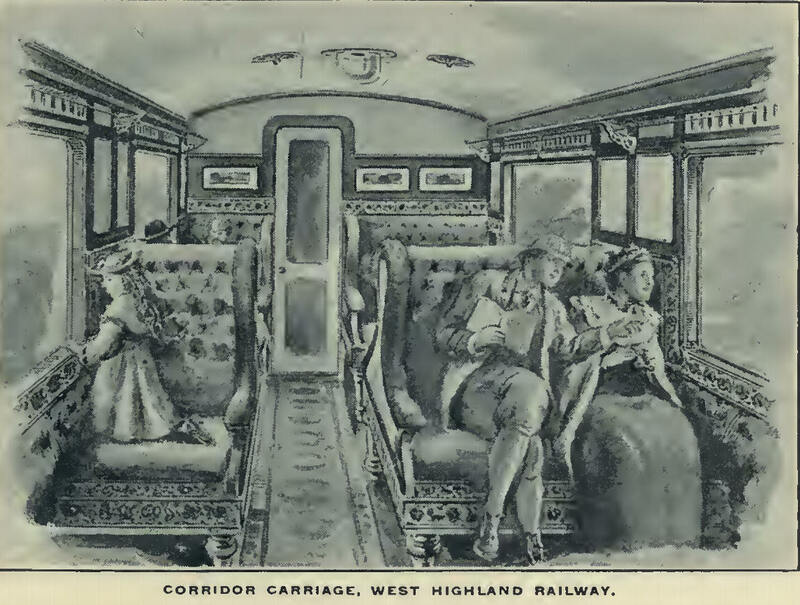 West Highlands—Ben a Chaistel at Auch—Caledonian Canal—The West Highland Railway, its hundred-mile run and view of Gareloch—Loch Katrine—Scenery on the line from Helensburgh to Ardlui, Gortan, Rannoch, Ben Lomond and Ben Nevis —Strathfillan—"Rob Roy" Country—"Lady of the Lake" Country—West Highland Railway, one of the great "show-routes" of Britain— Loch Earn. To Edinburgh and Glasgow by the North British Railway—Edinburgh—Scott Monument—Tolbooth—Princes Street—View from Calton Hill—Knox's House---St. Anthony's Chapel—Holyrood—Edinburgh Castle—Memories of Mary Queen of Scots—Salisbury Crags and Arthur's Seat—Pentland, Braid, and Blackford Hills—The "Old Town"—The "New Town," its beautiful architecture —Public Gardens—"Lang Dike," now called "North Loch"—Niddrie Castle—Linlithgow Palace—Glasgow—Queen Street Low Level Station—University and Scott Monument—Cathedral and George Square—The Clyde, its Docks and Shipping—The Exchange—Dunglass Castle and Bell's Monument, Bowling— Dumbarton Castle, the "Gibraltar of the Clyde "—Archway, St. Patrick's "Wallace's Seat "—Steamers at Bowling. Excursions to Balloch, Tarbet, Inversnaid, Ardlui, &c.—Balloch PierCardross—C raigendoran Station and Pier—Helensburgh—Bell' s Monument and Gareloch-head—Greenock—First Steamboat Advertisement, 1812—Steamboat Service from Helensburgh to Dunoon, Rothesay, Gareloch-head, Arrochar, &c. —Up the Loch from Gareloch-head—Slaughter betweeen the Coiquhouns and MacG regors—Ardencapel Castle, Helensburgh—Gareloch and Loch Long— "The Cobbler"—Glen Douglas—Ben Lomond—Arrochar Alps—Representative Clansmen in full Tartan—A West Highland Station—General Wade's Military Road —Route from Tarbet to the Trossachs—By Steamer along Loch Katrine—The famous Pulpit Rock—A Highland Glen. Ardlui—Glen Falloch—Picturesque Waterfalls—The Battle of Dairy—Finlang Castle, Loch Tay—"Rob Roy's Bath"-"Rob Roy's Soap Dish"—River Dochart, Killin—Remnant of Caledonian Forest—Falls of Connel—CrianlarichViaduct of the West Highland Railway —Callander—Bridge of DochartRemains of old Clachlan on Loch Earn Head, one of Rob Roy's hiding places— Pass of Brander, Loch Awe—Oban—Loch Dochart—Bruce and the Brooch of Lorn, story of his gallant fight—Falls of Cruachan, Loch Awe—Ben Doran— Loch Tulla and Crannoch Wood—Ben Voirlich. 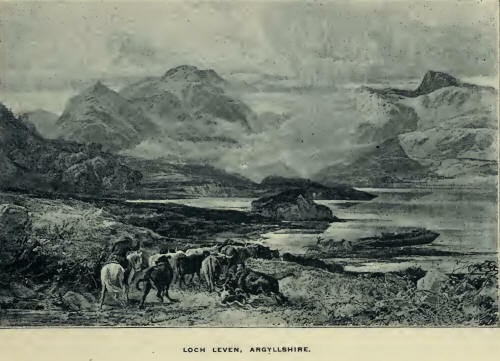 Rannoch Moor and Mountains of Glencoe— Schehallion—Loch LydochGlen Orchy—Marmore Deer Forest—A Primitive Lamp: Burning Fir Roots— Scene of the Appin Murder—Gauer Water, Rannoch—Glen Ogle—"Prince Charlie's Cave": Young Pretender, Cluny Macpherson and Lochiel's hiding place—Battle of Culloden—"Cluny's Cage": description of this curious lair— Loch Ericht, the dreariest, most desolate, and dismal of the Highland Lochs Loch-na-Chlaidheimh—"The Sword Loch" and its Story illustrated —Corrour Lodge, the highest shooting lodge in Scotland—Loch Ossian. The Scenery between the Forest of Atholl and Ben Nevis, the Moor of Rannoch and Glen Spean—"Council Island"—Ben Vreich—Loch Treig—A Plaintive Song: Cailleach Beinn a Bhric—Old Caledonian Forest—Parallel Roads of Glen Roy—On the Spean—Spean and Roy Bridge—Bhein Vhan—History of the Keppoch Murder—Highland Shieling--Ancient Feuds between the MacDonells and Maclntoshes—Tirindrish and. 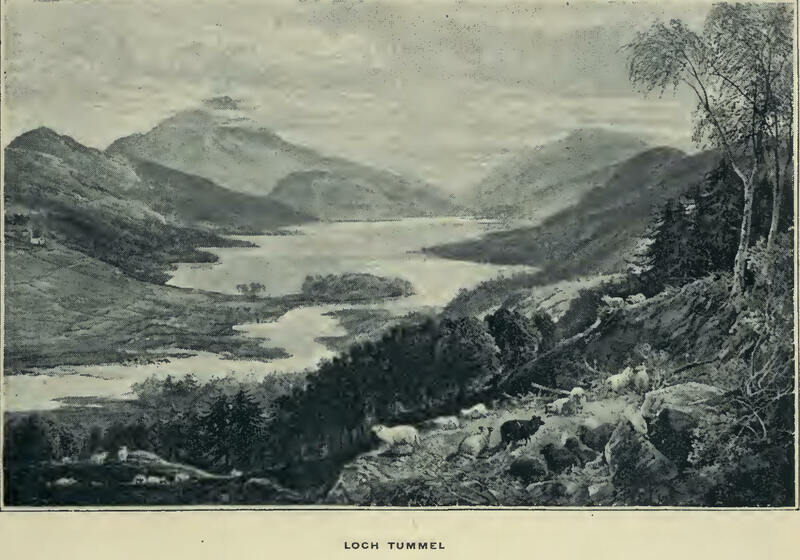 Achandaul—Falls of the SpenThe old "Long John" Distillery—"Comyn's Tower"—The River Lochy - Old Inverlochy Castle and Ben Nevis—Famous Fight at Inverlochy, 1645— Ian Lom, the Keppoch bard—A Glimpse of Fort William and its History— Ben Cruachan—Neptune's Staircase—The "Banavie Flea"—Day Trips from Fort William—Inverary Castle, Old and New. 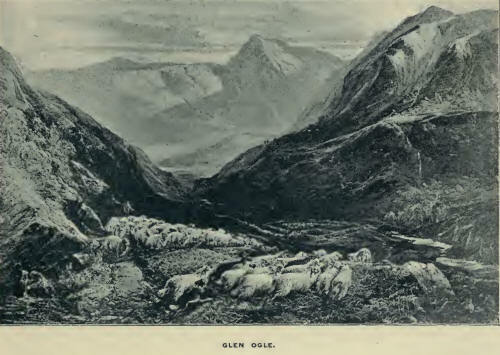 Glencoe; the scene of the infamous Massacre—Macaulay's description of the Glen—Ben Nevis from Loch Linnhe—Ballachulish Coach—MacIan, the aged chief—Loch Leven and the Pap of Glencoe—Carnach--"The Chancellor" and Ossian's Cave—"Faith, Hope, and Charity"—Devil's Staircase—Kingshouse —Black Mount Hills—Entrance to Loch Leven, Argyllshire—The Buchaille Etive, Glencoe—Lighthouse at Corran Ferry.